A New Perspective on the Barangaroo Headland was a design ideas competition that sought to generate creative concepts for the conversion of a flat port facility site to a major new public open space on Sydney Harbour. Corkery Consulting submitted an entry based on a concept that would retain the notion of a reconstructed landform but with a dynamic interpretation of deeply fissured sandstone slopes covered by Red Gum Forest (Angophora costata); a distinctive Sydney Harbour landscape. 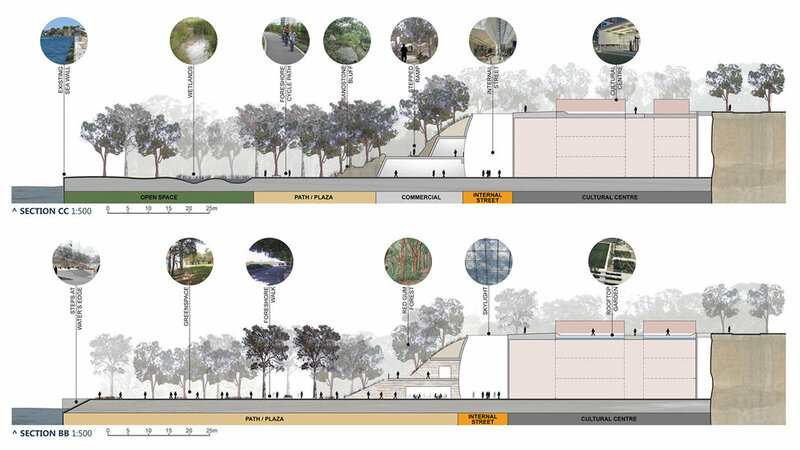 The design concept provided for interaction with the new headland to take many forms, including an internal streetscape providing access to the Cultural Centre within the headland landform and connectivity to adjoining commercial spaces. Starting from the north entrance at Walsh Bay, the landform would be revealed to visitors as they walk up the curving grassed slope past the sandstone cut that references the original geology of Millers Point; panoramic views across the Harbour would then open up. The top of the Cultural Centre within the reconstructed headland would extend above the ground plane to define a central courtyard, roof garden and public art exhibit. bridge and be drawn through the southern forecourt to the central internal space, revealing the Cultural Centre and commercial spaces. Natural light would flood from the skylights illuminating the internal street. Sunlight and views of Sydney Harbour would greet visitors at the northern forecourt. They would then descend stairs to enjoy the water edge and stroll along the boardwalk with views back to the new water’s edge. The boardwalk terminates where a ‘fissure’ slices back through the sandstone bluff into the central space of the headland. Continuing south along the path, pedestrians and cyclists pass informal rocky edges, the original wharf edge, adjoining green spaces and constructed wetlands. At the southern ‘fissure’ visitors ascend the stepped ramp across the sandstone bluff through the Red Gum forest to the central terrace. Walking across the top of the southern forecourt visitors enjoy views along the axis of the Barangaroo development, arriving at Argyle Place they would proceed to the historic ‘Rocks’ area of Sydney.